Using information that is accurate and appropriate for the topic. Thinking deeply about what their partner has to say. Accountable talk is considered to be crucial to classroom conversation as it creates shared expectations for all academic communication in the classroom. The three principles are equally relevant in a class meeting, a Socratic seminar, or a whole-class discussion. Such communication skills are valuable for students using inquiry and engaging in active learning. Fostering accountable talk in the classroom allows teachers to monitor the use of these indicators by listening to partners exchange information, and the questions students ask of one another inform the next segment of teacher-led instruction. WHAT: Teaching emotional Intelligence is sometimes hard mainly because it is something very abstract that young children don´t understand. They can expect that others understand their feelings but being empathic towards others, might be a different story. In this concrete stage, helping them “see and touch” the feeling may be very helpful to actually understand the different abstract feelings. HOW: Give students different textures, rough, smooth, hard, soft. Let them experience the touch and talk about the differences. Relate the difference between textures to different feelings and things that cause them. Ask students to talk about experiences were they felt: Angry, happy, sad, worried, etc and to say to which texture it relates to. While there is no correct or wrong answer, there will probably be similarities in the associations made between feelings and textures. Reach conclusions together and help them relate to them when something is happening to them or their peers to be able to start taking responsibilty over their feelings and choices on how to handle and channel them. Goleman Daniel. “Emotional Intelligence”. 1996. WHAT: A dynamic activity that requires students to stand up, move around and interact. If a teacher has to choose between saying something and letting students experience, to get to the knowledge, go for the second alternative. In this strategy the teacher can adapt the content to make it appropriate for different ages. HOW: make a chart with different things that students will have to go and ask for answers from classmates. Every time they get an answer, the classmates can either put a finger print (younger), sign the space or write the answer (older). For younger students make it simple, and a smaller chart (6 by 6 squares), and adapt it in content and quantity (more squares, 10 by 10) for older students. Look for someone in this class that… one square says: has been at a desert, next square says, has traveled to Europe, another square, has swam in a river, has escalated a volcano… and so on. Instruct the students to go around, find the person that matches, and according to age and your petition either, finger print, sign, or write their comment in the space. You can add: let them tell you about their experience. This is an excellent opportunity for students to share knowledge, experiences, and socialize. Follow with letting them choose one area they would like to find more about. They will be ready to investigate, read, write or make a Project about it. EVIDENCE: Active learning strategies accelerate understanding, recall, meaning and add enjoyment. Current brain research has suggested that new learning and physical learning may be linked. Through PET scans, scientist have realized that activity in the cerebellum is increased during both physical movement and/or novelty or new learning. There’s also evidence that when the emotions are engaged, the brain releases chemicals that mark the event and signal its importance, allowing for better recall and facilitates learning. Mel Silberman, Active Learning, Pfeiffer and Co.
Eric Jensen, Sizzle and Substance, Presenting with the Brain in Mind. WHAT: The challenge of working with students from poverty is not for the faint of heart. Aggression and passive behaviors are manifestations of the stress students living in poverty are faced with daily. It takes willingness and the capacity to view traditional, discipline behaviors as opportunities to teach new behavior and create a new reality. For students in poverty, a different reality creates a new way of being thus paving the way to a different future and outcome. In Jensen’s book, Engaging Students with Poverty in Mind, aggressive students that attended classes on appropriate coping skills and stress relieving techniques evidence a decrease in hostility. Providing explicit instruction and modeling of coping skills and stress relieving are critical to promoting peace in the classroom and creating a new reality for students greatest in need. HOW: Following are examples of proactive teacher modeling by Amanda Oelkers with prompts that promote positive, brain-based behaviors. Begin with a check of students’ feelings. Example: The teacher says, “Show me with your face how you feel?” The teacher models the appropriate feeling with their face. Use visualization to connect to a previous positive memory to change the state of the student. Example: The teacher says, “Close your eyes and think of a time that you felt happy.” The students can share their memories to further extend the feeling of happiness. Being proactive and promoting new, authentic ways to respond changes the brain and creates a new reality. Jensen E. (2013). Engaging Students with Poverty in Mind Practical Strategies for Raising Achievement. Alexandria, Virginia, ASCD. Hawn Foundation (2011). 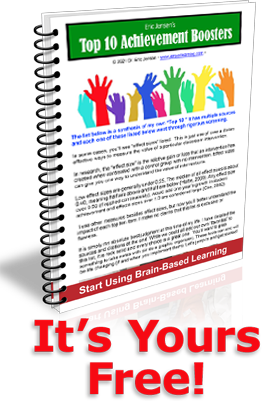 The Mind Up Curriculum Brain-Focused Strategies for Learning and Living. New York, New York, Scholastic. What? Create arousal and strong learning states to optimize learning. Instead of simply noticing that a student readiness “state” is a poor one, purposely change it to influence the upcoming learning. How? You can use a quick relevancy connection (“This will help you finish this part of the assignment in half the time”), novelty approach (use of competition or music), partner tie-in (“You can only do as well as you help your partner to also succeed), connect to long-term goals (“This helps you get more ready for that college you’re interested in”) “buy-in” (“This doubles as homework and classwork”) or other state arouser (like a quick energizer). Foxe JJ, Simpson GV, Ahlfors SP, Saron CD. (2005) Biasing the brain’s Attentional set: I. cue driven deployments of intersensory selective attention. Exp Brain Res., 166, 370-92. Chesebro, Joseph L. & McCloskey, James C. (2001, January). The relationship of teacher clarity and immediacy with student state receiver apprehension, affect, and cognitive learning. Communication Education, 50, 59-68. WHAT? Our brain’s neural networks are actually “assembled and connected” by life experiences. To get smarter, we prune away unused connections and foster newer, more relevant ones. This experience requires an enormous amount of quality experiential feedback. School is 800-900 hours a year and that means we need hundreds and hundreds moments of micro feedback to sculpt the brain. HOW? Examples include 1) peer editing (with a specific rubric), 2) competition (which usually rewards speed of processing as well as accuracy), pre-quizzes (to asses prior knowledge), discussion (to assess what you know compared with your peers) and asking Qs and creating quizzes to use in class. More quality feedback strengthens learning and it is also one the top motivators. Hattie, J.A. & Timperley, H. (2007). The power of feedback. Review of Educational Research, 77, 81-112. What: As teachers, we know it is important to give praise, feedback, and encouragement to students. However, could a genuine compliment combined with a smile actually increase student performance? It seems that might be the case. Japanese researchers have found evidence that people actually perform better after they have received a compliment. They conducted a study with adults who were tasked with repeating a finger exercise (following a sequence on a keyboard) and found that those who received compliments during the exercise outperformed those who did not. The striatum, a brain structure implicated in reward response was activated when participants received a compliment. The lead researcher, Professor Sadato, said this. “To the brain, receiving a compliment is as much a social reward as being rewarded money. We’ve been able to find scientific proof that a person performs better when they receive a social reward (a compliment) after completing an exercise.” In addition, there is evidence that a simple smile can get other people to trust you more (Mehu et al, 2007). When students trust you, they are more likely to cooperate and put forth effort. How: When giving feedback and direction to students regarding their work or their effort, make sure to compliment them on specific aspects or features of their efforts that you find most valuable. It is essential, of course, that compliments be specific and genuine. Compliments and smiles communicate to students that we care about them as individuals and that we know specific things about them. Compliments and smiles, it turns out, are more than “just being nice” to students. They can actually help to boost performance. Teams-Games-Tournaments, or TGT, optimizes content mastery through both competition and cooperation. Students at different ability levels work together in study teams to review key content and help each other fill in gaps with their learning. Students then leave their study teams to compete in an academic tournament with students from other study teams. During the tournament, students gain points for their study team by answering questions and challenging other players’ answers. The study teams that are most cooperative, and do the best job of preparing all team members to succeed in competition, earn the most points. Prepare short-answer objective questions and answer sheets and a study sheet to help students get ready for the tournament. Study teams of 3-5 students are created. All teams include high average, and low achievers. Study teams are given time to review content and prepare together. Students are reminded that the goal is to help all team members to do well in the tournament, not just individual students. Praise effective teams for the entire class to use as models. One member from each study team participates against other members from other study teams as part of a competition group (no more than five members). Unlike study teams, competition groups should be balanced (high achievers against high achievers, low achievers against low achievers, etc.). Tournament roles and rules are explained (all students write their answers on their answer sheets; questions are answered verbally; a player may challenge an answer; All teams have a checker- someone who verifies answers, and a score keeper). Game scores are collected and results are tallied. Students are allowed to discuss and reflect on the process. Results are posted. If possible, a simple tournament newsletter is prepared that celebrates the process as well as individual and team efforts. The affinity diagram is a business tool used to organize ideas and data, and with a few brain friendly revisions this strategy is one that allows for all students the time needed to process and contribute. Divide participants into groups with 4-6 members and each group stands around a selected table or working space. Provide each group with a piece of large chart table paper, pencils, post-it notes (5-10 for each member), 3-5 index cards, a marker. Instruct the groups that there will be no talking from this point forward. Group members will be given 1 minute to are to silently write a word or phrase on as many post–it notes as possible to address the prompt from their point of view and place the post it notes all over the “think pad” or chart paper. Call time after 1 minute and group members without talking read over all post-it notes. Group members then are given two minutes to without talking categorize the post-it notes, and to write titles for the categories on the provided index cards. Call time after two minutes and allow groups to verbally share their categories or to remain silent and walk around to view the posted chart paper with categories in a “Gallery Walk” approach. Tague, N.R. (2004). The Quality Toolbox, Second Edition, ASQ Quality Press. WHAT ? Chalkboard Splashes are very useful for addressing the big picture and the relevance of whatever topic is being taught. They can be used for quick formative assessments to get a feel for how every student in the class would respond to a question, and to help further deepen discussion and higher order thinking. After recording their responses, students are asked to analyze peer responses for three things: similarities, differences, and surprises. Student responses can be kept for later reference, to spur and guide further learning or used for assessment purposes. “What were the similarities, differences, and surprises? Create a sentence starter, prompt, or question for which you would like all students to see all of their peers’ responses (these can also be used with brief Quick-Writes and Quick-Draws). Generated student responses, are copied or written onto random or designated places on the chalkboards, whiteboards, or chart papers. Students get into small groups and share what they have noticed in terms of similarities, differences, and surprises, before asking for volunteers to share their group’s findings.